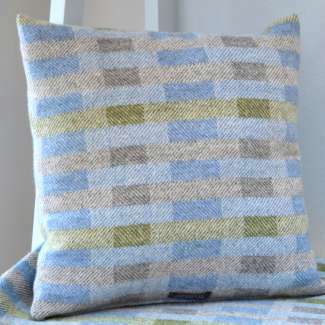 As a textile designer and handweaver I am best known for my beautifully soft lambswool throws, cushions and home textiles which are woven using complex block weave drafting techniques. My designs are strongly influenced by Scandinavian weaving traditions, and my colour aesthetic has much in common with the beautiful and naturalistic colour palette of early 20th century Swedish women rug weavers such as Marta Maas-Fjetterstrom and Ingegerd Silow . Each of my collections is a celebration of my love of colour and pattern and an opportunity to explore new weave structures and design elements. 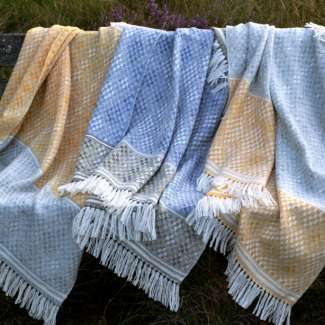 Every piece is meticulously handwoven, hand fringed or blanket stitched and hand finished by me in my Surrey / London studio, and as a result every piece is unique. My first loom. It was built for my Dutch mother-in-law by her father, and had just 2 shafts. My own textile journey started at the London costumiers, Bermans and Nathans, where I made costumes for film and theatre, before moving to Cornwall and designing my own clothing collection using handwoven and hand dyed cottons and silks from India. 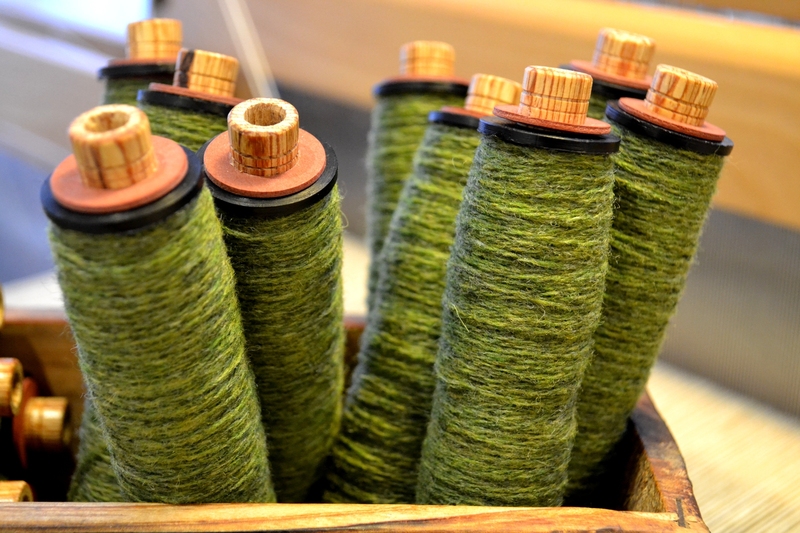 In Cornwall I also taught myself to spin, weave and dye with natural plants. I still spin and dye, but my great passion is weaving. I undertook the 2-year weaving diploma at Handweavers Studio in North London in 2011 and this enabled me to start my own weaving practice. 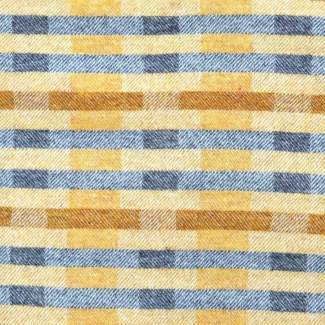 But I continue to research and studying weaving – particularly Scandinavian weaving and block weaving and drafting. 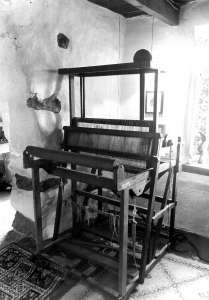 The history of weaving fascinates me. It goes back thousands of years and in terms of traditional patterns and weaves is enormously diverse. Scandinavia has an particulary rich heritage of weave structures, patterns and techniques partly due to its formidable trading links with all parts of the globe established during the Viking Age. But it also has an enormous resonance with me in terms of its strong symmetry and blocks of bold geometric shapes, and the earthy colour palette found in many Scandinavian textiles. My colour preferences are so old and completely unchanged with time. I can trace them back to a box of Caran D’Ache oil pastels I was given as a small child. My favourites then are just the same today – the various ochres, umbers and siennas, burnt and raw, a certain deep malachite green, the muddier spruce and olive green, and the vibrant indigo, gentian and Prussian blue. They also happen to be the colours of the things I loved best as a child – the colour of Cornish sand and sea, of lichen on gnarled apple trees and granite dry stone walls, the ruddy brown and strong earth colours of Devonshire clays, and the bright blues of the flowers my father loved so well. They are a range of colours I share in common with the strikingly beautiful and naturalistic colour palette of the early 20th century Swedish women rug weavers such as Marta Maas-Fjetterstrom and Ingegerd Silow whose work constantly inspires me. I weave my throws and cushions on a 32 shaft Louet Megado computer dobby loom and I design my textiles using specialist weaving software. 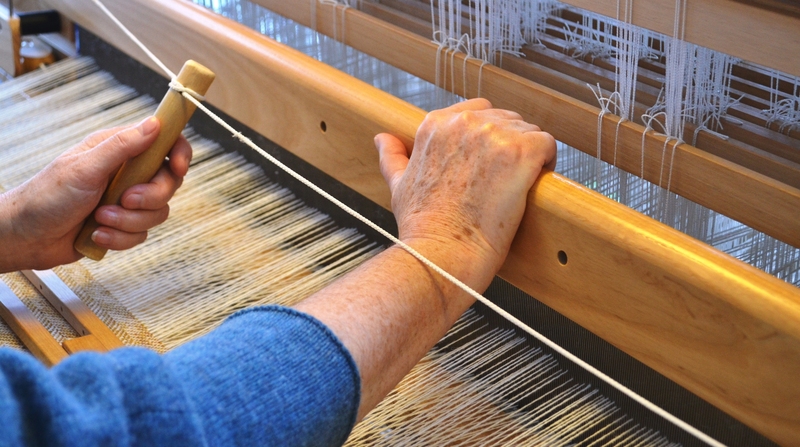 In connecting computer to loom, the electronic dobby mechanism on the loom reads my design and selects the right combination of shafts to lift each time I manually change the shed to weave. I still use all the traditional knowledge and skills of the handweaver – and both my hands and both my feet are put to work. My hands throw the shuttle, beat the cloth and wind on the warp whilst my feet press down the treadle to change the shed (lifting or lowering the threaded heddles on the shafts to create the pattern). 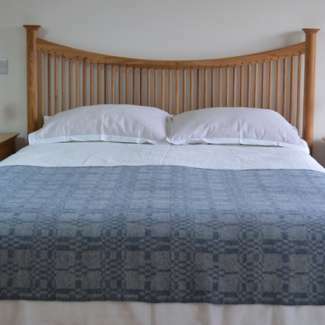 Absolutely all my beautifully soft and warm lambswool throws and cushions are woven using the same warp threading and are part of an ongoing project called One Warp, Infinite Designs exploring how many unique and original designs I can develop on one warp threading. The method has great merit in terms of providing me with an enormously flexible warp on which I can weave all the patterns I have created. Which means I can quickly respond to custom orders no matter what collection I may be working on. It also provided me with the wonderful opportunity to share and teach this method in Denmark when I was invited to the Festival of Weaving in West Zealand. The yarn I use for my throws is spun from first-clip lambswool sourced from two British spinning companies – one in Scotland and one in England. The wool comes mostly from Australia and New Zealand, following a centuries old practise of British spinning mills. 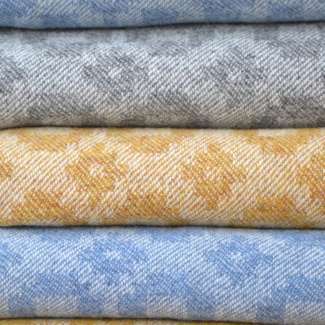 It is top grade supersoft lambswool spun in fabulously subtle and heathery blends of colours. I love the colours because they really appeal to my own aesthetic – soft and natural colours that are gentle on the eye. Having such a flexible threading system has kept me occupied for nearly three years now and I still have many new designs in the pipeline. Most recently I have been finding ways to combine some really old Scandinavian weaves like Monks Belt and Dubbeldbinding (a form of doublefaced cloth) into my twill woven textiles. I am also working in collaboration with the South West National Trust on a fundraising initiative called ‘Weaving a path for Trevose Head‘. This is me doing my but for a place that is very special to me. 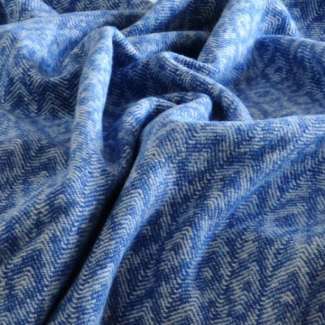 I am literally weaving a path for Trevose Head by donating £50 from the sale of each of my Trevose Head throws to fund conservation work on the headland and the coastal path that surrounds it.